Product categories of Decorative Leather, we are specialized manufacturers from China, Decoration PVC Leather, Decorative Leather suppliers/factory, wholesale high-quality products of Decorative Leather R & D and manufacturing, we have the perfect after-sales service and technical support. Look forward to your cooperation! Packaging:Packing: 30m/roll, Out Poly Bag. Packaging:Packing:30M/Roll,Out Double Poly Bag; Shipping Marks on the Both Tops of Roll. Packing: 30m/roll, Out Poly Bag. Packing:30M/Roll,Out Double Poly Bag; Shipping Marks on the Both Tops of Roll. Decoration Leather is a kind of high-tech and environmental-friendly product, it has a wide range for the home interior decoration. 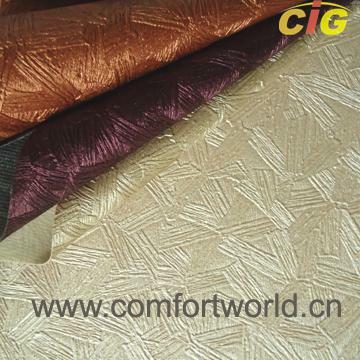 The designs are various and fashionable, and the hand feeling is very soft.